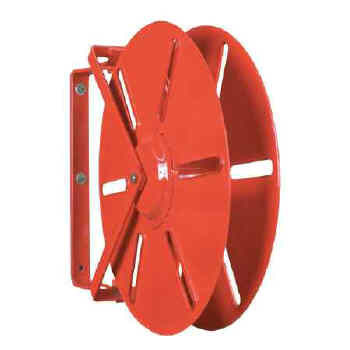 Offering storage for your fire hose, Heavy-Duty Hose Reels feature solid 16-gauge steel sides and hubs and come with a hook-and-loop back strap to keep hose securely wound. The mounting hardware features a welded steel 1" x 3/16" reel bracket with a 1 1/2" x 1/4" steel wall bracket that swings 180° and easily adapts to pipes (1 1/2"-3") with optional pipe bracket set. Red baked enamel finish.